Lt. Gino Tenpenny, an old-school cop, goes paranormal to track down a killer. 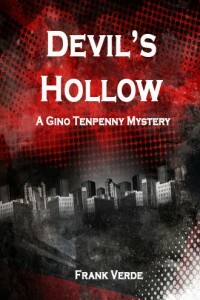 “Devil’s Hollow” is a detective mystery that introduces Lt. Gino Tenpenny, a well-seasoned, no-nonsense lawman attached to a fictitious city in northern New Jersey. Once a Marine, always a Marine, Tenpenny says of himself. Tenpenny is like two of his football heroes: Vince Lombardi and Jim Brown, two legends from another time. He’s someone who believes in tradition and commands respect like Lombardi. But he’s also someone who is old-school tough like Brown. And very much like Jim Brown, be aware that there’s a danger to Tenpenny lurking just underneath the surface. In this debut story, Tenpenny finds himself with a single mom as his new partner and a 20-year-old cold case to solve. Two men are found slain in an apartment in Tenpenny’s town. One of them is the longtime fugitive and main suspect in the original “Devil’s Hollow” killing in New York City. The other is one of his would-be victims from long ago. The real killer promises, “Devil’s Hollow was only the beginning,” in a series of taunting e-mails to the media and Tenpenny himself. When Jim Croce wrote “You Don’t Mess Around With Jim,” he had a line in there that said: “You don’t tug on Superman’s cape.” He could have been writing about Gino Tenpenny.